Legendary defender Jamie Carragher has questioned whether or not Daniel Sturridge will be our first choice striker this season. The England international is a doubt for the opening match against Arsenal with a hip injury, and Carra believes Origi might prove to be Klopp’s long-term number nine. “I don’t know if Daniel Sturridge will be the starting striker,” he said. “Divock Origi played in a lot of the big games in Europe last season and has done well in pre-season. 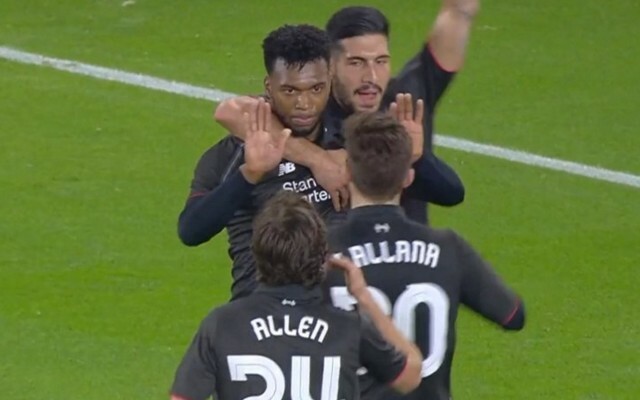 Origi was on the scoresheet as we beat Barcelona 4-0 last weekend and was preferred over Sturridge for the Dortmund away game last season. Firmino was picked for Villarreal away when Origi was injured. Sturridge was on the bench for both games. “James Milner has a good understanding of the game and great fitness levels, but of course Liverpool need to sign a left-back,” he added. “They have sold Brad Smith to Bournemouth and you need two players for every position so they need someone else alongside Alberto Moreno. “Milner did a good job against Barcelona but you certainly wouldn’t want to go into the season without one more recognised left-back.” (via SkySports). He finished off by saying he thinks Klavan will partner Lovren at the Emirates on Sunday. What do you think of Carra’s comments? Do you agree with his opinion on Sturridge? Let us know in the comments.